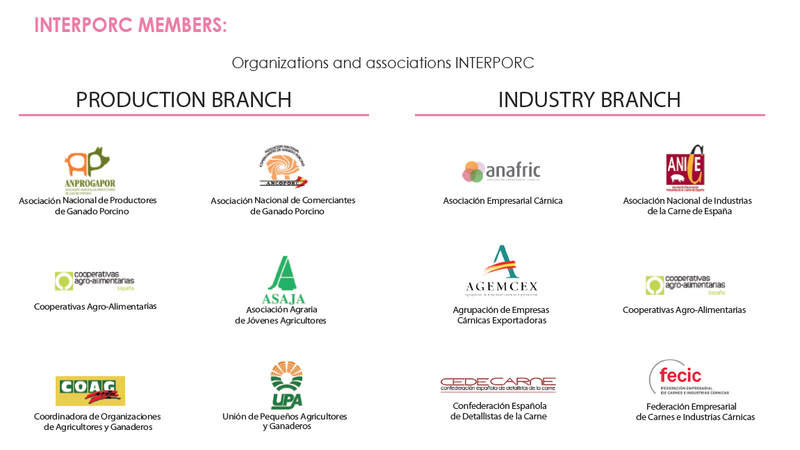 ​INTERPORC Spain Organizacion Interprofesional Agroalimentaria del Porcino de Capa Blanca (Spanish Inter-professional Agri-Food Organization for White Pork) is a non-profit entity that represents the entire Spanish white pork sector, including its production, industrial processing and marketing. It is the most important Inter-professional organization of the meat sector given the volume of the pork production in our country. Contribute to economic development and profitability of the sector and support its international expansion. Improve the perception of the Spanish white pork meat and pork meat products, by providing the consumers and the professionals in the industry all the information regarding its healthy benefits and high quality. Boost the innovation and research directed at solving specific problems of the white pork sector. Disseminate the concerns that the members have in common within the entire sector. Share the common concerns of the members within the entire sector.